CIT Blackrock Castle Observatory is open to submissions from artists who wish to display works of a scientific and/or astronomical nature. The gallery walls at Blackrock Castle and all its public spaces including multi media facilities & the Castle Cafe are open to creative display. Collaborative works between BCO and artists are welcomed with projects such as Cork’s Solar System Trail, Capture the Cosmos and Boundary Works an example of the rich results that manifest when artist meets scientist. 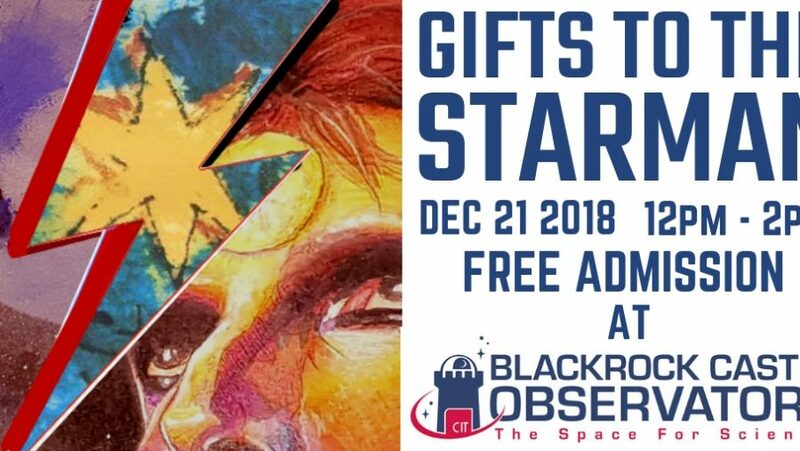 Gifts to the Starman is an exhibition inspired by the David Bowie classic, Starman, and features an original artwork by the artist himself. The original Bowie artwork is a handmade rice paper serigraph ‘Star’, that David Bowie gave to a friend as a Christmas gift in 1975. ‘Star’ is on loan to CIT Blackrock Castle Observatory for the duration of the project. A once in a lifetime opportunity to “hang out” with David Bowie! The exhibit showcases exceptional young talent, and the inspirational power of Bowie’s work and life is immediately apparent. Starman conjures images of a world full of potential, but in need of guidance. There is trepidation, but also hope. This sense of cautious hope is exquisitely captured in the work of these burgeoning artists and writers. The exhibit will run from December 17, 2018 to January 7, 2019 at CIT Blackrock Castle Observatory, launching at 12 pm on Friday, December 21. Admission is free to the exhibit launch. Normal admission prices apply for the duration of the exhibit. The collection of author John O’Sullivan (In the Footsteps of Columbus: European Missions to the International Space Station) is a superb overview of the history of human spaceflight. From the early missions of the 1960s, the Apollo Moon Landings, through to the construction of the International Space Station, follow along with the missions and the astronauts. A Paradigm of Things is a collection of digital art and a collaborative effort between Paul Walsh, Prasad Gade and James O’Sullivan. Awesome Universe is a photography exhibition that celebrates 50 years of Europe’s quest to explore the southern sky, marking the 50th anniversary of the European Southern Observatory (ESO). To celebrate we are exhibiting 10 of these visually stunning images, showcasing celestial objects such as galaxies, nebulae, and star clusters as seen by ESO’s observatories — home to the world’s most advanced ground-based telescopes. For this exhibition David Upton has drawn for inspiration on the astronomical and socialist histories of Cork City focusing on the plough constellation as a symbol which at once embodies both the celestial and the earthly. In using archival material, photography, video and cast iron and aluminium sculpture David mixes themes of the local with the cosmic. Through a recent engagement with an outdated iron casting process at the National Sculpture Factory and use of images taken with CIT Blackrock Castle Observatory’s optical telescope metaphors are made to the primal processes of creation and destruction. Harmony of the Spheres created by Cork based musician Brian Leach is a musical piece incorporating a live feed of data, streamed directly from the 32m radio telescope at National Space Centre. The live signals are manipulated into playing a ten tone scale devised by splitting the octave into ten equal parts. Some of the harmonies produced are new to our ears, while others are reminiscent of Western or Pythagorean intervals. Interact with these sounds from the universe by using the Theremin. In celebration of Global Astronomy Month we’re running a very special photographic exhibition of the Southern and Northern Hemispheres.